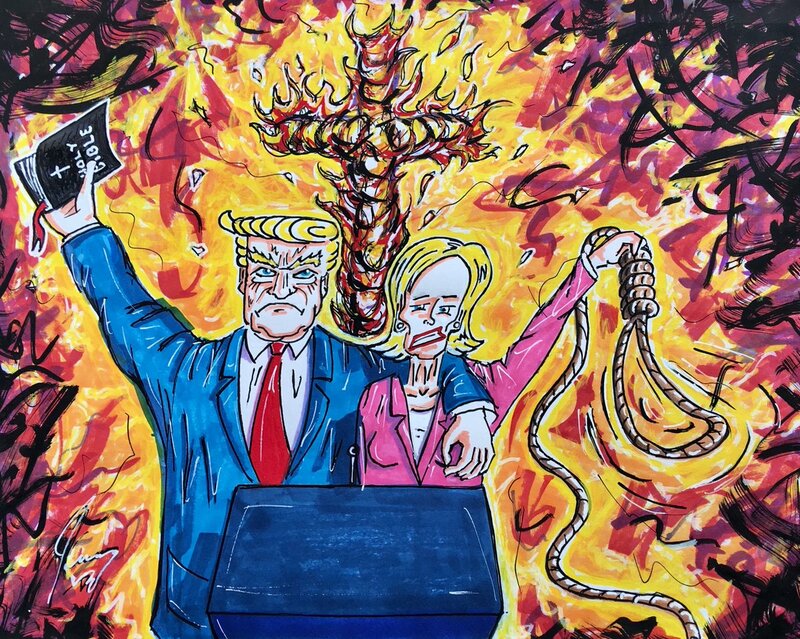 Jim Carrey has taken a strong stance against Donald Trump and Republican junior Senator Cindy Hyde-Smith in a new, fiery painting. The actor shared new artwork on Twitter on Sunday, while urging his followers to support Hyde-Smith's opponent in Mississippi's Senate runoff election on Tuesday. Carrey, who is used to expressing his political beliefs through his art, drew Trump and Hyde-Smith sitting behind a lectern, engulfed in flames. Trump has his arm around Hyde-Smith's shoulders in the painting, and is holding a copy of the Bible. Hyde-Smith, meanwhile, is depicted holding a noose. "Mississippi you are BETTER than these hate-mongers," Carrey wrote as he shared his artwork. He asked others to vote for Democrat Mike Espy, adding: "Show the world. Vote for Mike Espy this Tuesday, November 27th." Hyde-Smith, who has been endorsed by Trump, has drawn ire after she was seen in a video praising a supporter by saying: "If he invited me to a public hanging, I'd be on the front row." She has also been criticised for a photo showing her wearing a replica hat of a Confederate soldier. Mississippi has a history of racially motivated lynchings and violence against people who sought voting rights for black citizens. Tuesday's vote is the last US Senate race to be decided in 2018 and will determine whether Republicans pad their slim majority. The winner Tuesday finishes the final two years of a term started by Republican Senator Thad Cochran, who resigned in April amid health concerns.